In July 2018, Paris Aéroport welcomed 10.4 million passengers, an increase of 3.7% compared with July 2017. 7.2 million passengers travelled through Paris-Charles de Gaulle (+4.2%) and 3.2 million through Paris-Orly (+2.6%). The number of connecting passengers decreased by 3.1%. The connecting rate stood at 18.8%, down by 1.3 points compared with July 2017. Since the beginning of the year, Paris Aéroport passenger traffic has increased by 3.1%, with a total of 60.3 million passengers. The number of connecting passengers has decreased by 3.6%. The connecting rate stands at 21.1%, down by 1.4 points. Passenger traffic at TAV Airports, 46.1%-owned by Groupe ADP, increased by 47.8% in July 2018 and by 34.1% since the beginning of the year, including, from May 2018, traffic of Antalya airport, in which TAV Airports took a stake. Passenger traffic at Santiago de Chile Airport, 45%-owned by Groupe ADP, increased by 8.7% in July 2018 and by 9.9% since the beginning of the year. Passenger traffic at Amman Airport, 51%-owned by Groupe ADP, increased by 5.7% in July 2018 and by 7.2% since the beginning of the year. Groupe ADP and TAV Airports have, a shareholding of 21% and 15%, respectively, in Zagreb Airport. To be compliant with TAV Airports presentations, Zagreb Airport traffic figures are integrated into the TAV Airports group traffic figures. TAV Airports hase taken a stake in Anlalya Airport since May 2018. To be compliant with TAV Airports' presentations, the % change presented above takes into account Antalya traffic just from May 2018. Restated figures taking into account Antalya's traffic on a like-for-like basis for 2017. TAV Airports has taken a stake in Antalya Airport since May 2018. To be compliant with TAV Airports' presentations, the % change presented above takes into account Antalya traffic just from May 2018. 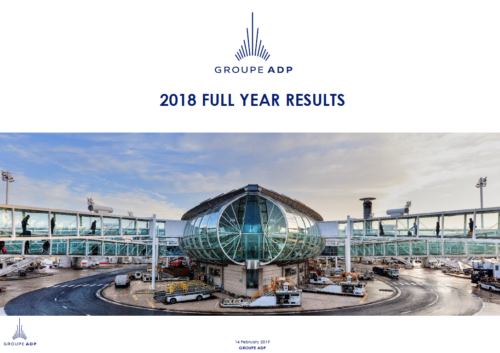 Groupe ADP develops and manages airports, including Paris-Charles de Gaulle, Paris-Orly and Paris-Le Bourget. In 2017, the group handled through its brand Paris Aéroport more than 101 million passengers and 2.3 million metric tonnes of freight and mail at Paris-Charles de Gaulle and Paris-Orly, and more than 127 million passengers in airports abroad through its subsidiary ADP International. Boasting an exceptional geographic location and a major catchment area, the Group is pursuing its strategy of adapting and modernizing its terminal facilities and upgrading quality of services; the group also intends to develop its retail and real estate businesses. In 2017, group revenue stood at €3,617 million and net income at €571 million. Registered office: 1, rue de France, 93 290 Tremblay-en-France. Aéroports de Paris is a public limited company (Société Anonyme) with share capital of €296,881,806. Registered in the Bobigny Trade and Company Register under no. 552 016 628.